Khadadah M, Jayakrishnan B, Muquim A, Roberts O, Sinan T, Maradny N, Lasheen I. High Resolution Computed Tomography in Asthma. Oman Med J 2012 Mar; 27(2):145-150. 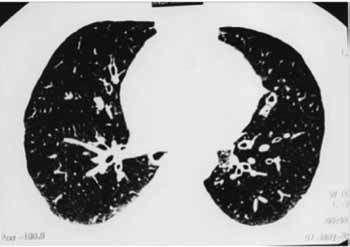 Keywords: Asthma; Computed tomography; HRCT; Pulmonary function; Air trapping; Bronchiectasis. Asthma is a chronic inflammatory disease of the airways, the evolution of which follows the natural course of inflammation. Inflammation, demonstrable in almost all asthmatic patients is already present in the airways of patients with very mild asthma, and increases with the severity of the disease.1,2 The pathophysiologic mechanisms of asthma include bronchospasm, hyper secretion and chronic airway inflammation; but more recently, attention has been focused on bronchial fibrosis and structural defects of the bronchus, implying a third component, already proposed in the American Thoracic Society definition.3 However, many patients with uncomplicated asthma have a normal chest radiograph and do not show structural lesions. Computed tomography scan provides a high degree of anatomical detail and has been used in the diagnosis of airway diseases, such as emphysema,4 and bronchiectasis.5 High resolution computed tomography (HRCT) has allowed visualization of airways and parenchyma in much greater detail than conventional CT or plain radiography. Paganin et al.6 reported that expected abnormalities were seen in 37.8% of the chest radiographs; while at the same time, CT scans were abnormal in 71.9% of the cases. The structural changes in asthma comprise mucoid impaction and atelectasis, air trapping, bronchiectasis, bronchial dilatation, and bronchial wall thickening; although some causes of wall thickening such as airway wall edema, mucoid impaction, and bronchoconstriction are potentially reversible. Pulmonary function studies are the main measures used to assess and monitor airway obstruction in asthma. This study was undertaken to document the HRCT scan abnormalities in asthma and to also correlate these abnormalities with clinical and pulmonary function data. Adult patients with stable asthma attending the Chest Clinic of the university teaching hospital, Mubarak Al Kabeer Hospital, Kuwait during a six month period from July 2004 to December 2004 formed the study population. The diagnosis of asthma in these patients was established long before by the physicians on the basis of typical history of wheezing, breathlessness, recurrent exacerbations, and previous response to asthma medications, as well as spirometry results and peak expiratory flow rate (PEFR) variability. The project was approved by the ethical committee of Kuwait University. This permitted us to utilize the facilities provided by the government without any expenses to the patient. Air trapping was assessed visually by identifying areas of persistent low attenuation on expiratory series compared to the inspiratory slices and also objectively by noting a change of <100 HU. The lung fields were divided in to six zones: upper (UZ), mid (MZ) and lower (LZ) on each side; right (R) and left (L) viz. RUZ, LUZ, RMZ, LMZ, RLZ and LLZ for the measurement of air trapping. The measurements were made on either side at the level of the aortic arch for the UZ, carina for the MZ and 5 cm below the carina for the LZ.13 Lung density can be quantitatively assessed using CT attenuation values. Each pixel (picture element) of a CT image has a CT attenuation value that is expressed in HU (Hounsfield Units), which range from 3095 HU for dense cortical bone to -1000 HU for CT density of air. The normal CT density of the lung is -700 to -800 HU on inspiration. In subjects with air trapping, lung regions retain air during exhalation and remain relatively radiolucent compared with normal lung regions. The lung attenuation increases within the areas measured were considered to be abnormal and indicative of air trapping if it measured less than 100 HU. Lung attenuation increases exceeding 100 HU were considered to be normal. Grading of air trapping was done depending on the number of zones in which changes were found. Normal if none, mild if 1or 2 zones, moderate if 3 to 4 zones and severe if more than four. For the purpose of analysis; the duration of asthma was reclassified as asthma of less than 10 years duration and asthma of greater than 10 years duration. This was mainly to look for the differences in the findings between long standing asthma and asthma of a shorter duration. The severity of symptoms was also reclassified as mild and severe. Patients with mild intermittent asthma and mild persistent asthma were grouped into mild and patients with moderate persistent and severe persistent asthma were grouped into the severe category. The data was then tabulated and analyzed using the statistical package for social sciences program (SPSS, PC Version 12.0). Chi Square test or Fischer’s exact test were used to assess any association between categorical variables. Differences between the expiratory and inspiratory measurement of lung attenuation were correlated with percent predicted FEV1and FEF 25-75 using the Spearman rank correlation test as well as the correlation coefficient and the significance was noted. Of the 40 patients who underwent HRCT; only the data of 28 patients could be analyzed. Full details were not available for a few and some did the HRCT more than 7 days after the initial evaluation and pulmonary function studies. Sixteen (57.1%) of the studied patients were Kuwaitis, 6 (21.4%) were other Arabs and another 6 (21.4%) were Asians. There study group comprised of 20 (71.4%) males and 8 (28.6%) females; with a mean age of 41.39±12.24 years. Sixteen (57.1%) patients had moderate persistent asthma, 6 had mild (21.4%) and another 6 (21.4%) had severe persistent asthma. While thirteen (46.4%) patients were having asthma for 1 to 5 years and 12 (42.9%) were having asthma for >10 years. Eighteen (64.7%) patients were non smokers and 7 (25%) were ex-smokers. Inhaled steroids were being used by 82.1% of the patients while 85.7% were using inhaled bronchodilators regularly. The mean percent predicted pulmonary function parameters were as follows: FEV1 69.12±16.8%; FVC 81.7±14.9%; Total lung capacity 101.01±10.03%; Residual volume 147.07±29.35%; and diffusion 117.2±21.92%. The mean FEV1/FVC ratio was 69.49 ±8.28%. Chest radiograph was normal in 9 (32.1%) patients while it showed some amount of hyperinflation in the rest. However, no structural abnormalities were noted. Abnormal HRCT findings like bronchial wall thickening (57.1%; Fig. 1), bronchiectasis (28.6%; Fig. 2), mucoid impaction (17.9%), mosaic attenuation (10.7%), air trapping (78.6%) and plate like atelectasis (21.4%) were noted in these patients. Bronchial wall thickening (p=0.044) and bronchiectasis (p=0.063) were most commonly seen in males; while bronchiectasis was mostly common in Asians (p=0.003). Mucoid impaction was seen only in patients with asthma for less than 10 years (0.053). No significant difference was noted in the rest of the findings in relation to the duration of the illness or the severity of symptoms, (Table 1). The mean lung attenuation measured in inspiration was -877.17±23.18, -879.21±41.08, -879.36±35.95, -876.88±37.80, -872.79±42.12 and -876.13±40.04 HU in the RUZ, LUZ, RMZ, LMZ, RLZ and LLZ, respectively. Figure 1: HRCT picture showing bronchial wall thickening. 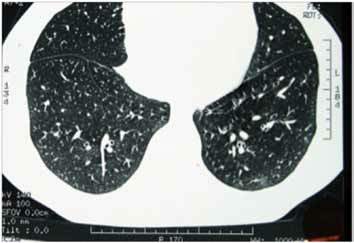 Figure 2: HRCT picture showing bronchiectasis. Figure 3: HRCT in expiration. Figure 4: HRCT in inspiration. Table 2: Mean lung attenuation measured in inspiration and correlation of FEV1 and FEF 25-75% with air trapping in different lung zones. It has been well documented that in HRCT scans asthmatic patients manifest more abnormalities related to permanent airway remodeling such as bronchial dilatation and bronchiectasis than do normal subjects. We observed that these structural changes though common in HRCT in patients with asthma, were not present in the same frequency as reported in other studies. Contrary to expectations, these changes were not related to the severity of airflow obstruction or the disease duration. Air trapping did not show any strong association with the physiologic parameters of airway obstruction, either FEV1 or FEF 25-75. Linear atelectasis and mosaic attenuation were also noted in a good number of patients. Boulet et al. studied airway responsiveness and bronchial wall thickening in asthma. No statistically significant difference was found in airway wall thickening between subjects with asthma and control subjects.19 Thickening of bronchial walls seen in patients with asthma are presumably due to sub mucosal thickening resulting from inflammation, thickening of the muscularis layer due to mucosal hypertrophy and peribronchial fibrosis. Sequential CT scans on four patients with acute asthma during treatment with large doses of steroids and bronchodilators did not demonstrate any significant changes in the degree of bronchial wall thickening.6 Park et al. found that Asthmatics with an FEV1 of <60% most frequently exhibited bronchial wall thickening than patients with normal airflow or minimal airway obstruction.12 The absence of any correlation in our study between these structural changes and the severity or duration of the illness and from the observations from the studies reported above, the relevance of any particular abnormality to the clinical condition still remains unclear. In the current study, air trapping was found to be mild in females; whereas it was of moderate intensity in males. It was interesting to note that contrary to expectations, air trapping was most severe in patients with mild persistent asthma than in patients with moderate persistent asthma. Again, the duration of the illness was also not related to the severity of air trapping as majority of the patients with asthma for 5-10 years and longer than 10 years duration only had mild air trapping. Low attenuation areas can be seen in CT images in asthma and could be a consequence of regional reduction of pulmonary blood flow, gas trapping, emphysema, or a combination of these. 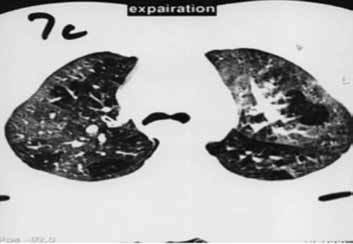 HRCT documentation of emphysema does not identify whether these areas represent emphysema with alveolar wall destruction or simple hyperinflation. Hence the estimates of emphysema in asthmatics with CT scans range from 0% to 80%.6,14,15,20 Expiratory HRCT may show air trapping even when the inspiratory slices fails to do so or when it is completely normal.21,22 Air trapping on expiratory HRCT scans in patients with normal findings on inspiratory scans is most often associated with bronchiolitis obliterans and asthma.23 We subjectively identified these areas in inspiratory slices and measured objectively the actual intensity after the expiratory slices. One can identify air trapping within a single secondary pulmonary lobule on CT scan, whereas spirometric measurements only provide a more global measure of hyperinflation. Neuman et al. on applying quantitative measurements of pixel index, found that the percentage of lung with abnormally low attenuation values in asthmatic patients had a statistically significant correlation with air trapping assessments by pulmonary function.24 The difference in the expiratory and inspiratory scans also showed significant positive correlations with residual volume and total lung capacity.25 In another report, abnormal HRCT findings, such as bronchiectasis, emphysema and mosaic pattern of lung attenuation were found to be more common in asthma with moderate to severe airflow limitation and in those with a prolonged history of asthma. Specific airway conductance, FEV1 and FEF25-75 were lower than those having asthma without such findings.26 Little et al. found a trend towards an association of bronchial wall thickening in HRCT with FEF 25-75 but not with FEV1, indicating that small airway dimensions may be of importance and should be assessed in such studies.27 The results of another study indicate that extensive small airway abnormalities may be associated with near fatal asthma, and that these abnormalities are partially reversible after the successful control of asthma symptoms.28 In the current study, though FEV1 in the left mid and lower zones and FEF 25-75 in mid and lower zones of both sides were inversely correlated with the air trapping, it was not of a significant degree. Overall, structural changes were common in HRCT in patients with asthma but these changes were not related to the severity of airflow obstruction or the disease duration. Air trapping did not show any strong association with the physiologic parameters of airway obstruction, either FEV1 or FEF 25-75. 1. Bousquet J, Chanez P, Lacoste JY, Barnéon G, Ghavanian N, Enander I, et al. Eosinophilic inflammation in asthma. N Engl J Med 1990 Oct;323(15):1033-1039. 2. Djukanović R, Roche WR, Wilson JW, Beasley CR, Twentyman OP, Howarth RH, et al. Mucosal inflammation in asthma. Am Rev Respir Dis 1990 Aug;142(2):434-457. 3. Standards for the diagnosis and care of patients with chronic obstructive pulmonary disease (COPD) and asthma. This official statement of the American Thoracic Society was adopted by the ATS Board of Directors, November 1986. Am Rev Respir Dis 1987 Jul;136(1):225-244. 4. Hong KY, Lee JH, Park SW, Joo JH, Kim DJ, Moon SH, et al. 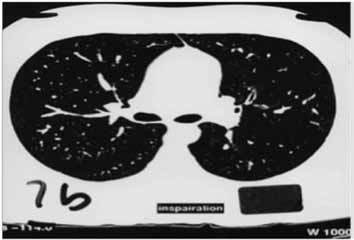 Evaluation of emphysema in patients with asthma using high-resolution CT. Korean J Intern Med 2002 Mar;17(1):24-30. 5. Altin R, Savranlar A, Kart L, Mahmutyazicioglu K, Ozdemir H, Akdag B, et al. Presence and HRCT quantification of bronchiectasis in coal workers. Eur J Radiol 2004 Nov;52(2):157-163. 6. Paganin F, Trussard V, Seneterre E, Chanez P, Giron J, Godard P, et al. Chest radiography and high resolution computed tomography of the lungs in asthma. Am Rev Respir Dis 1992 Oct;146(4):1084-1087. 9. Grenier P, Maurice F, Musset D, Menu Y, Nahum H. Bronchiectasis: assessment by thin-section CT. Radiology 1986 Oct;161(1):95-99. 10. Naidich DP, McCauley DI, Khouri NF, Stitik FP, Siegelman SS. Computed tomography of bronchiectasis. J Comput Assist Tomogr 1982 Jun;6(3):437-444. 12. Park CS, Müller NL, Worthy SA, Kim JS, Awadh N, Fitzgerald M. Airway obstruction in asthmatic and healthy individuals: inspiratory and expiratory thin-section CT findings. Radiology 1997 May;203(2):361-367. 13. Stern EJ, Webb WR, Gamsu G. Dynamic quantitative computed tomography. A predictor of pulmonary function in obstructive lung diseases. Invest Radiol 1994 May;29(5):564-569. 14. Paganin F, Séneterre E, Chanez P, Daurés JP, Bruel JM, Michel FB, et al. Computed tomography of the lungs in asthma: influence of disease severity and etiology. Am J Respir Crit Care Med 1996 Jan;153(1):110-114. 15. Lynch DA, Newell JD, Tschomper BA, Cink TM, Newman LS, Bethel R. Uncomplicated asthma in adults: comparison of CT appearance of the lungs in asthmatic and healthy subjects. Radiology 1993 Sep;188(3):829-833. 16. Grenier P, Mourey-Gerosa I, Benali K, Brauner MW, Leung AN, Lenoir S, et al. Abnormalities of the airways and lung parenchyma in asthmatics: CT observations in 50 patients and inter- and intraobserver variability. Eur Radiol 1996;6(2):199-206. 17. Harmanci E, Kebapci M, Metintas M, Ozkan R. High-resolution computed tomography findings are correlated with disease severity in asthma. Respiration 2002;69(5):420-426. 18. Machado D, Pereira C, Teixeira L, Canelas A, Tavares B, Loureiro G, et al. Thoracic high resolution computed tomography (HRCT) in asthma. Eur Ann Allergy Clin Immunol 2009 Oct;41(5):139-145. 19. Boulet L, Bélanger M, Carrier G. Airway responsiveness and bronchial-wall thickness in asthma with or without fixed airflow obstruction. Am J Respir Crit Care Med 1995 Sep;152(3):865-871. 20. Kinsella M, Müller NL, Staples C, Vedal S, Chan-Yeung M. Hyperinflation in asthma and emphysema. Assessment by pulmonary function testing and computed tomography. Chest 1988 Aug;94(2):286-289. 21. Arakawa H, Webb WR. Expiratory high-resolution CT scan. Radiol Clin North Am 1998 Jan;36(1):189-209. 22. Webb WR. High-resolution computed tomography of obstructive lung disease. Radiol Clin North Am 1994 Jul;32(4):745-757. 23. Arakawa H, Webb WR. Air trapping on expiratory high-resolution CT scans in the absence of inspiratory scan abnormalities: correlation with pulmonary function tests and differential diagnosis. AJR Am J Roentgenol 1998 May;170(5):1349-1353. 24. Newman KB, Lynch DA, Newman LS, Ellegood D, Newell JD Jr. Quantitative computed tomography detects air trapping due to asthma. Chest 1994 Jul;106(1):105-109. 25. Gono H, Fujimoto K, Kawakami S, Kubo K. Evaluation of airway wall thickness and air trapping by HRCT in asymptomatic asthma. Eur Respir J 2003 Dec;22(6):965-971. 26. Park JW, Hong YK, Kim CW, Kim DK, Choe KO, Hong CS. High-resolution computed tomography in patients with bronchial asthma: correlation with clinical features, pulmonary functions and bronchial hyperresponsiveness. J Investig Allergol Clin Immunol 1997 May-Jun;7(3):186-192. 27. Little SA, Sproule MW, Cowan MD, Macleod KJ, Robertson M, Love JG, et al. High resolution computed tomographic assessment of airway wall thickness in chronic asthma: reproducibility and relationship with lung function and severity. Thorax 2002 Mar;57(3):247-253. 28. Lee YM, Park JS, Hwang JH, Park SW, Uh ST, Kim YH, et al. High-resolution CT findings in patients with near-fatal asthma: comparison of patients with mild-to-severe asthma and normal control subjects and changes in airway abnormalities following steroid treatment. Chest 2004 Dec;126(6):1840-1848.